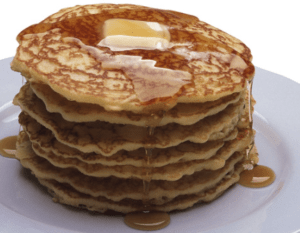 A big stack of fluffy pancakes for breakfast, what could possibly be better than that? A good pancake is a thing of beauty from the crispy edges to the cloud like center. You can top them with Keto friendly whipped cream and still stick to your Keto diet. This is not only a great way to get way to get all the fat you need, it’s delicious. You can add a little cinnamon or cocoa powder to the mix to add a little flair to the meal. One of my favorite ways to enjoy pancakes is with butter and cinnamon sugar. The bite of the cinnamon and the sweet of sugar combined with itsy bitsy little crunches of the sugar crystals. It’s awesome and you can have all that and stay Keto. Just use erythritol instead of sugar. Or you can have the classic butter and syrup on your pancakes and can make that in about 5 minutes. Put the water, erythritol and maple extract in a small sauce pan and whisk it while you’re bringing it to a gentle boil. Once you have achieved a gentle boil, let it simmer for about 5 minutes – stirring occasionally. After 5 minutes of simmering put transfer from the sauce pan to a blender and sprinkle (don’t dump) the xanthan gum and puree until there is it is thoroughly mixed with no lumps. Wait a few minutes to see if the syrup is thick enough for you if it is not then repeat the previous step. Don’t add more than 1/16th of a tsp when you repeat.